We’ve been working to find ways to make cold commutes as pleasant as possible. Don’t run back to the carpool lane before you’ve tried out these 12 tips for biking in the winter. 1. Check the Weather Before You Leave. Look for two things. A) The current temperature. If the mercury is at or below freezing, you have to be extra careful about black ice on the roadways. B) The forecast for the trip back. If it looks gnarly, pack accordingly. Don’t trust it. Always assume slick spots are ice until proven otherwise. Sewer caps, drainages and bridges can stay frozen and slippery longer than the rest of the road. Ideally, you’ll avoid it, but if it’s too late you’ll want to know how to handle it. Don’t brake hard. Wheels lock up easily on ice and before you know it you’re on the pavement. Ride straight. Unless you have studs, save maneuvers for places with reliable traction. Feet at the ready. Honestly, foot checks rarely help on ice (because your foot slips just as much as your tire), but they can make a fall less horrible. For this reason, it’s best to ride platform pedals in the winter. This is the best way to keep maintenance costs low. Show your bike the love it deserves. On that note, in extremely wet and salty areas, it’s smart to leave your best bike in the garage and opt for a beater instead. 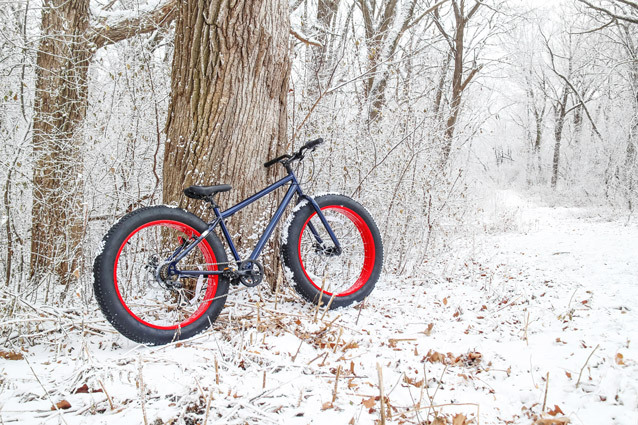 Fat bikes are a great option for commuting in the snow. 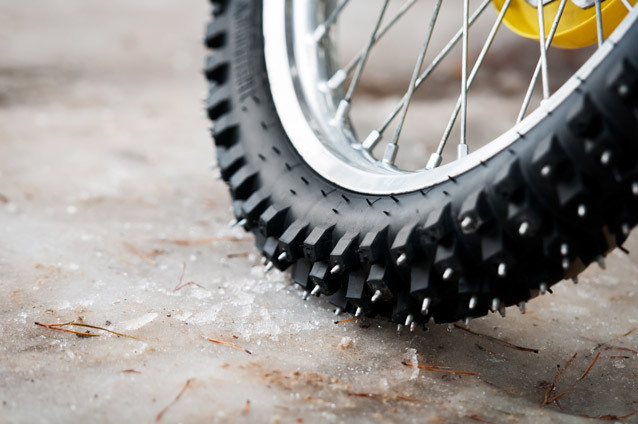 If you want to keep it skinny, studded snow tires are as effective on bikes as they are on cars. If your commute is longer than a few blocks, panniers are essential for keeping your back and underarms sweat-free, which is vital in the cold. Though you may be able save time by skipping that post-ride shower, winter commute times can be more unpredictable. 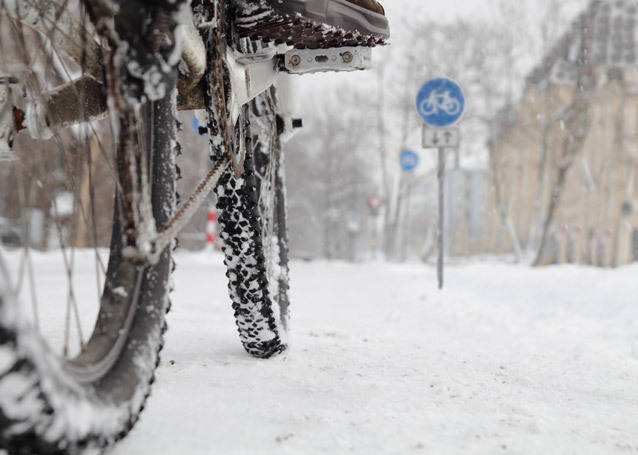 Even if it means taking a slightly longer route, riding on pavement instead of snow will make up the extra time. Your core will heat up quickly, but without proper clothing, your fingers, toes and ears will turn your commute into an instant sufferfest. 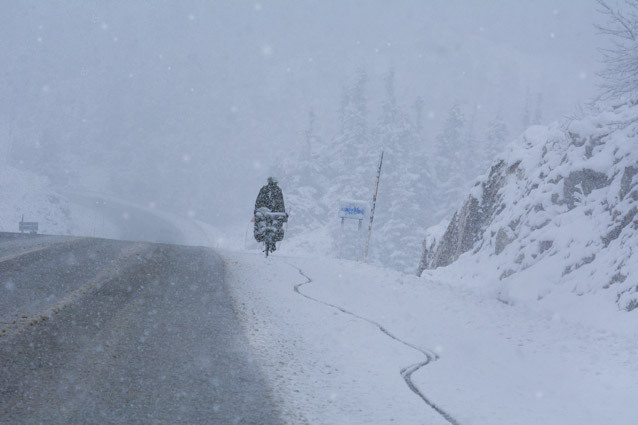 At the worst times in the craziest weather, take a second to stop and appreciate how rad it is to be biking year round. A few clutch items can make all the difference (fenders, good gloves, a powerful light, etc.) and with Active Junky cash back they’ve never been more affordable. Stay tuned for our testers’ top picks. Need more inspiration to pedal through the pain? 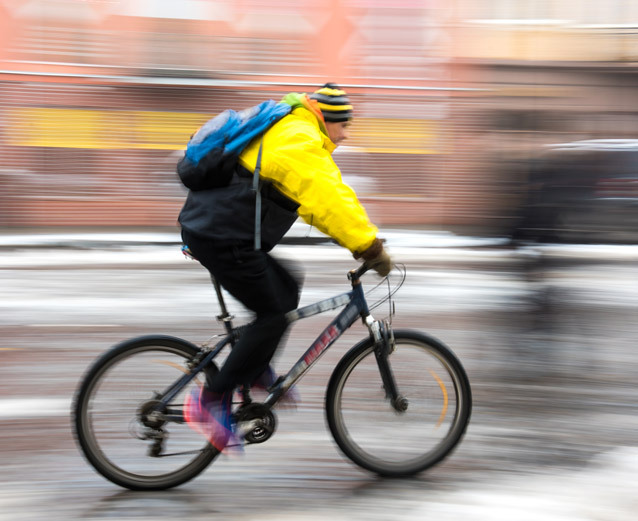 Here are Ten Reasons to Bike To Work in the Winter and some Gear Suggestions.